Sexuality: Heterosexual I think? I'm pretty sure I'm the only dragon so it doesn't matter. Personality: I'm happy when my owner is happy because when my owner is happy they are nice to me. I love when I can scare people off from my owner because then it shows I am valuable and that they shouldn't sell me. My newest owner is a little mean but I think it's because she is scared of me. I'm going to show her I'm not scary to her. I noticed she doesn't like the males. I'll keep the males away from her. Fears: If I upset my owner I get hurt or don't get fed. Strengths: I'm big and nobody will mess with my owner. Weaknesses: She must obey whatever her master commands. She can not hunt for herself. She would not be able to defend herself or her master against another dragon. Besides having no training or parental guidance the sheer shock of another one being around would leave her stunned. Appearance: Drakon mostly looks like an icewing with her sharp features from the claw on her wings to the trail of large spikes all the way down her spine. Even some of her teeth are on display out of her mouth. To a human she's very frighting looking but to a dragon she has quite the elegant build. 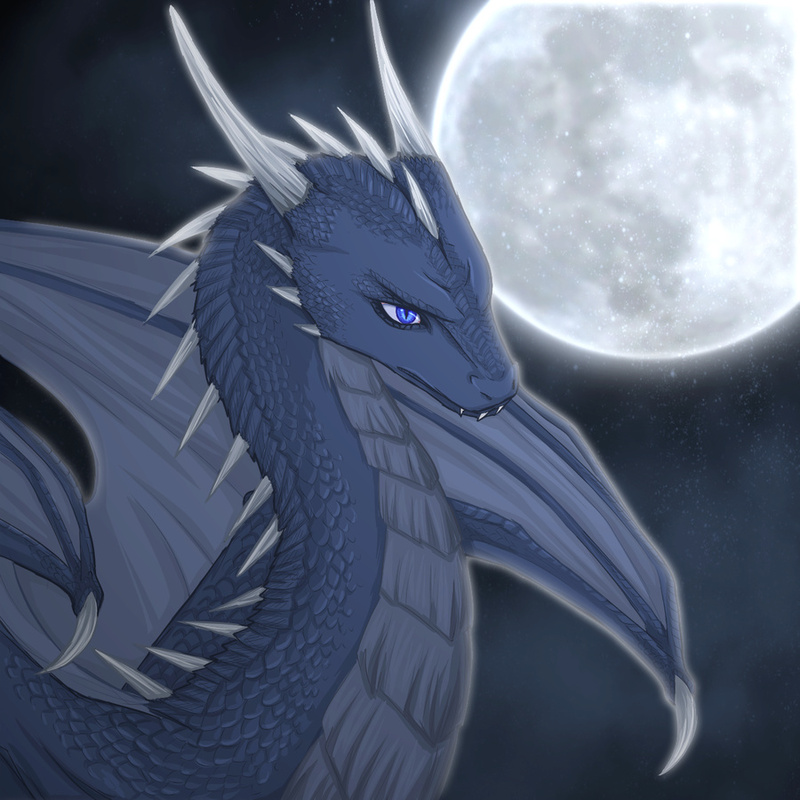 Special Abilities: Drakon didn't inherit any abilities from her IceWing side most of that was appearance and her very dangerous claws. She also didn't inherit a breath weapon from either side. Instead her genetics deemed it fit to give her a venom that is incredibly potent. After a single post a max EarthWing sized dragon would grow weak. After the second they would be in great pain and probably panic. Third complete paralysis. Finally fourth death if not treated. The time remains the same for smaller dragons but the smaller they are the harder it is to treat. Combat Style: She hasn't really fought much. Most humans just run the moment she starts growling. Against say another dragon she would stand no chance aside from her potent venom. History: Drakon was stolen while she was but an egg. She was raised to be a pet but mostly to be a guard. She under went strict training and conditioning and wouldn't dare disobey her owner. Her owner is the only voice she has to listen to and she knows when she has been sold to a new one. She understands humans speech perfectly and can speak it very well but it isn't allowed. It was drilled into her at a young age never to speak. She is but an animal and not allowed to communicate with humans. Due to her being raised by humans since hatching the human language is the only one she knows. She doesn't know a word of dragonic and doesn't even know there are other dragons out there. Recently she has been purchased by the infamous assassin Naviera. Weaknesses please, thank you. And this incredibly potent venom seems... incredibly potent for a 50% EarthWing, at least in terms of the number of posts for each stage to take effect in larger dragons. Would these stages happen in the same number of posts for smaller dragons? And when you say, "an EarthWing sized dragon, what height range did you have in mind? Are you talking max height, medium, smaller? She may only be 50% EarthWing but she has no breath weapon from either her EarthWing side or IceWing side. The only advantage she gains from her IceWing inheritance is the claws. Not only does she basically only have on major attribute of the natural abilities a dragon can poses but this is also enhanced with it also being her special ability rather than having the natural venom of an EarthWing + a special ability. Made an edit to the ability to account for size variation. Okay, looks good. Still need to see at least one weakness, though, even if it's just stating her lack of abilities.